Cultivating its mission To give every guest a legendary experience since its inception in 1981, Pizza Ranch connects with its communities in a way that provides bridges for friends, family and colleagues to come together. 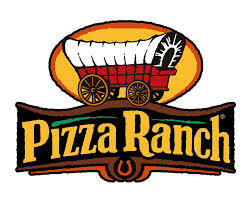 Today, Pizza Ranch is based in Orange City, Iowa and owns, operates and franchises over 190 locations in 13 states. Consistent growth has been a Pizza Ranch staple, as the brand has become a beacon of community involvement and exceptional food. The Pizza Ranch buffet features legendary pizzas, salads and desserts, and is delivered with an unmatched service quality. We are extremely blessed to have a very close connection with our guests, said Adrie Groeneweg, co-founder and president of Pizza Ranch. This project extends the brand’s essence to a new dimension beyond our four walls and into their lives. It’s a new kind of way for us to relate to our loyal fans. Last week at youth group the youth minister asked all the kids to raise their hands if they like Christmas music, and come to find out my darling daughter didn't raise her hand. BAH HUMBUG she doesn't like Christmas music! Where have I gone wrong with her? So I started asking her WHY?? What's the deal? How can you not like Christmas music? Come to find out, she doesn't like the majority of Christmas music. 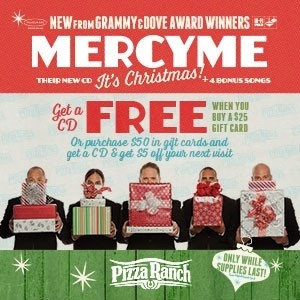 There are a few exceptions like Pentatonix and YES she likes this Christmas CD by Mercy Me! Maybe I haven't gone wrong after all. Although she did inform me it's still too early to play Christmas music, the appropriate date to starting listening is apparently the day after Thanksgiving! Yippee it's almost time (according to Makenzie). Anyway, I really enjoyed this CD and can't wait to listen as I play taxi driver and take my kids back and forth to all of their different activities and I added it to my Christmas playlist on my iPhone. You really can't go wrong with anything by MercyMe, they're one of my absolute all time favorites. In the comments let me know what your favorite Christmas song is. Mine is Mary did you know? *Open to the US and Canada. Giveaway ends on 11/24/15 at 11:59pm CST.